Turkey vultures (also known as buzzards in the southern United States) are large blackish brown birds that can be found throughout North America from southern Canada southward. Adult turkey vultures have red heads while their young (pictured above) usually have black heads. 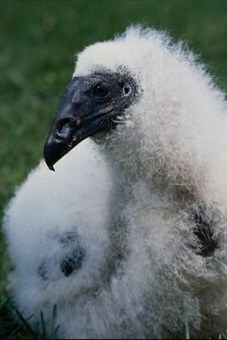 The young will be ready to fledge after about three months and will take up to 5 years to achieve full adult plumage. Every year on March 15, buzzards return to Hinckley, Ohio. In 1957 a reporter for Cleveland Press reported that the Cleveland Metroparks rangers had documented for at least 25 years that buzzards return to Hinckley each year on March 15. On that date in 1957, in response to the report, the town of Hinkley was surprised by over 9.000 skeptical spectators, reporters, bird watchers and naturalists who came to observe the arrival of the buzzards for themselves. The buzzards arrived on schedule as predicted, and have arrived on March 15 every year since then. The citizens and Chamber of Commerce declared the first Sunday on or after March 15 as Buzzard Sunday. Each year HinckleyTownship residents host Buzzard Day activities to mark the return of the buzzard to the Hinckley Reservation of Cleveland Metroparks. 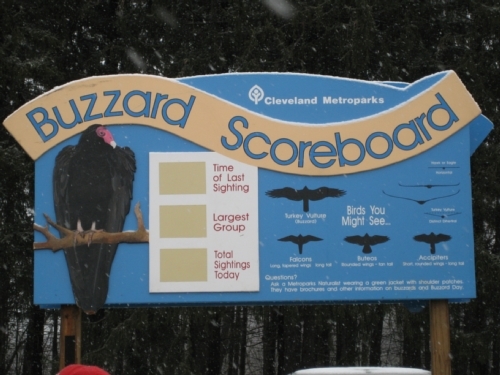 At 7:00 am on March 15, Bob Hinkle, the chief of outdoor recreation for Cleveland Metroparks and the official buzzard spotter, records the arrival time of the first buzzard. Bird watching enthusiasts gather for the event, wearing Buzzard T-shirts, buttons and hats. The buzzards typically arrive between early morning and 3:00 pm. On Buzzard Sunday, free events are sponsored by Hinckley Township Chamber of Commerce and Cleveland Metroparks at Hinckley Reservation’s Buzzard Roost. These events include displays and exhibits, music, live bird shows, naturalist led hikes, bus tours, and the buzzard score card that records the number of buzzards spotted. The community organizes other fundraising activities such as a pancake breakfast with proceeds going to local charities. Legend has it that in 1818, Judge Hinckley of Massachusetts, an Ohio land owner, learned that some predatory animals were destroying local domestic animals and crops. He organized a group of friends who circled the perimeter of his acreage and moved toward the center of the property killing predatory animals along the way. This became known as “The Great Hinckley Hunt of 1818.” The hunters took what they could use for food, and left the rest of the carcasses there for winter. When the buzzards returned in the spring the feast was so impressive that it became imprinted on their brains, causing them to return each year. The buzzards play a role in sanitizing the area while they are in town. 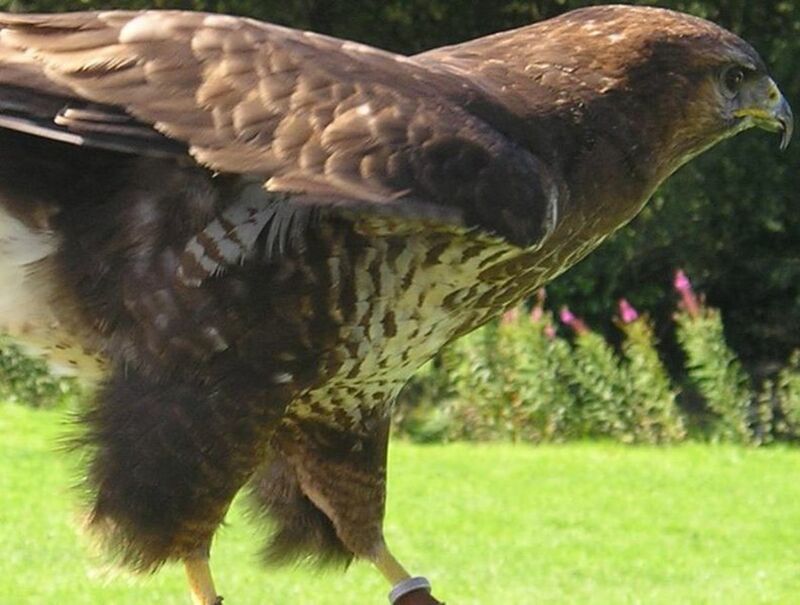 Buzzards are one of a few birds with a sense of smell. They use their sense of smell to locate decomposing remains even if hidden from sight. Their digestive system kills all bacteria and viruses in their diet and their droppings do not carry disease. 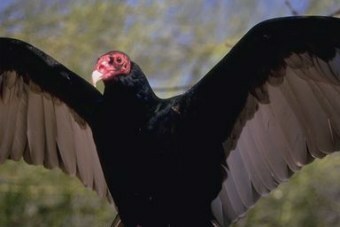 Buzzards are actually turkey vultures, and do not kill. Their beaks and talons are not designed to tear into a live carcass. Like turkeys, buzzards roost rather than nest. The Hinckley Reservation is an ideal habitat for the buzzards. The rocky ledges surrounding the 90 acre Hinckley Lake are perfect for roosting. Hikes – 9:15 a.m., 10:45 a.m. & 12:30 p.m. Bus Tours of Hinckley Reservation – 10 a.m., 11 a.m., noon, 1 p.m. and 2 p.m.
Live Birds of Prey Programs: 10 - 10:30 a.m. , 11:30 a.m. - noon & 1:30 - 2 p.m. Families with the last name Buzzard are invited to meet other Buzzard families and win a prize in a Buzzard Family Contest. Group Buzzard Family photo 10 a.m.
Cleveland Metroparks Nature Shop selling unique buzzard merchandise! 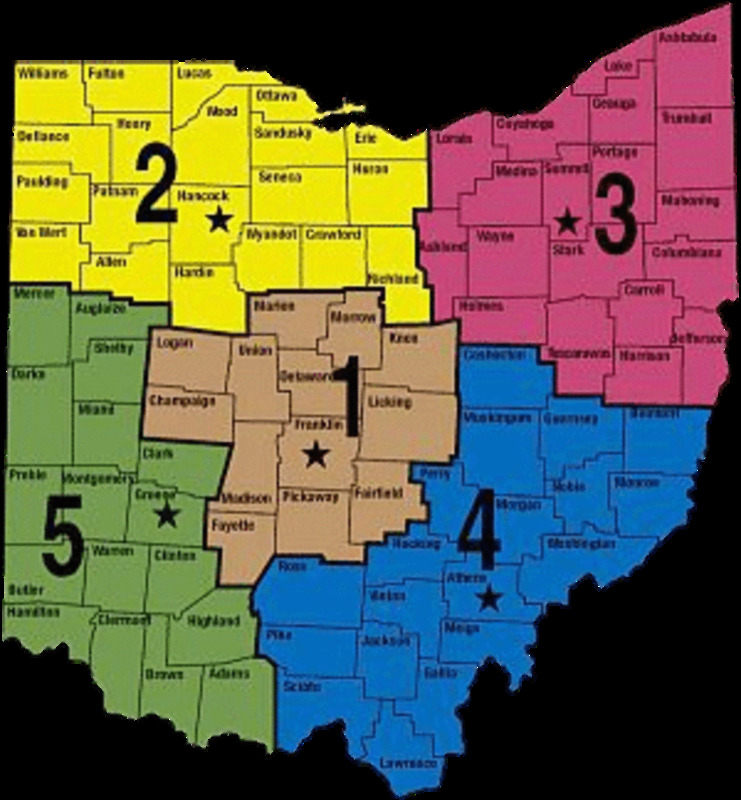 Exhibits & Other Activities 9 a.m. - 2:30 p.m.
Food Concession (for a fee) 9 a.m. - 2:30 p.m.
FREE shuttle bus service from the Bath House parking lot and Whipp’s Ledges parking lot to Buzzard Roost. Buzzard Roost is located at the corner of State Road and West Drive in Hinckley Reservation, in Hinckley Township – south of Route 303. What an unusual event but very interesting. I saw these beautiful birds in New Mexico I think, circling above Taos waiting for the throw outs of fast food joints?! Perhaps. But this Hinckley event seems much more natural. Voted up for Turkey Vulture, a fantastic bird. is this the link, marcella? http://news2you.n2y.com/ It would be exciting to watch online for people who can't make it to Hinckley! I'm guessing they will be back this year, but we did have a really warm winter so there may be more suspense than usual:) Thanks for commenting, and I hope you enjoy the buzzard news this year. We are repeating the unit of studdy from News 2 You a picture based newspaper online. This year we are just as excited about the news. We are watching the online info to find out if they come this year. kimho39, GREAT and AMAZING hub. LOVED it. Voted up and all the buttons! I appreciate YOUR talent very much. And now, May I, with your permission, become a fan and a follower? I love to associate myself with talented writers and hopefully, learn from them. Including YOU. Thanks. Kenneth Avery, from a rural town, Hamilton, in northwest Alabama that looks like sweet little Mayberry, the town on the Andy Griffith Show. Peace to YOU! Kim Hello, What an engaging and fact filled hub. I really enjoyed reading this and what a hoot - the townsfolk actually make it into an event! So cool. Buzzards - who'd have thought it? Very interesting story in there that is quite funny.I love this article so much and really enjoyed it. I just came from your tale of the free vulture hub, DJ. That's interesting too. Thanks for stopping to read and comment! It would be kind of a long trip for you, but let me know if you go! How cool is that! - a day celebrating buzzards. Perhaps I can go some day. I loved learning more about buzzards since I frequently see one or more out here in the countryside where I live. Thanks for sharing! Hinckley is outside of Cleveland. I've never been there, but an old boss used to go with his wife every year! That's how I knew about it. ...every time I come here I have an adventure - and an exciting one at that!!!! @e-man: buzzards don't have dentures; only adventures. ....I laughed so hard that I spit my dentures out onto the keyboard and now I look like a hockey player who has lost too many fights - in particular your comment/reply to Simone Smith - the hubs or the comment???? ..well on that note I must say that it would be strange NOT to tell you how awesome you are - and that's the plain truth Ruth!!!!! Do you have buzzards or vultures in S Africa, Tony? Their arrival marks the almost beginning of spring...at least in Hinckley. Glad you enjoyed and thanks for the read and comment. As a bird lover I found this most interesting. I have not heard of birds with such a superb sense of time before! Thanks for this very interesting bit of bird lore. ...and if they poop on you, don't worry 'bout it! I'm glad I could contribute to your wealth of knowledge, story. If you're ever on a game show and they ask buzzard questions, you'll be in good shape. Thanks for reading, enjoying, and taking time to comment, story. Fascinating! I did not know buzzards were among the only birds who could smell. I also did not know there was a day celebrating these birds anywhere, lol. Thank you for teaching me something new today! I will think of you next time I see buzzards circle on my walk. LOL! The hub or the comments? Maybe I could add a poll! Thanks for noticing and commenting Simone. But be a buzzard if you can. When you're licking road kill off the tar! You have to eat or else you'll die. @Rose - Isn't it odd? I think it's funny that the rangers recorded it for 25 years before reporting it to the media, and that the buzzards keep the town clean! @vern - praise Him if you're so inclined! Up until now, I didn't know about the swallows returning to San Juan Capistrano on March 19. Thanks for that. So much to learn, so little time! Thanks for stopping in for a read vern. Interesting... that's funny that they always come back on the same day. Well, you pull these interesting fascinating "buzzards" right out of your hat! You must win at Trivial pursuit, hands down! I guess you probably know that the swallows return to San Juan Capistrano in the same fashion on March 19, which I think is the feast of St. Joseph. Well, March 15 is the ides of March, when supposedly Julius Caesar was assassinated, and I believe the story goes that the buzzards came to eat his remains. I just made that up!! I loved reading this hub. Really!! And I like the info regarding this inside tracs, taking care of all the bad stuff and none of it being in their poop! How amazing is that? Gotta be a God, right? Anwho, thanks for another awesome piece. Thanks dahoglund. I had a boss once who went every year with his wife. They knew a lot of people who also went every year, so it was a social event for them as well. An interesting bit of local history. I've been where eagles are celebrated but not vultures.